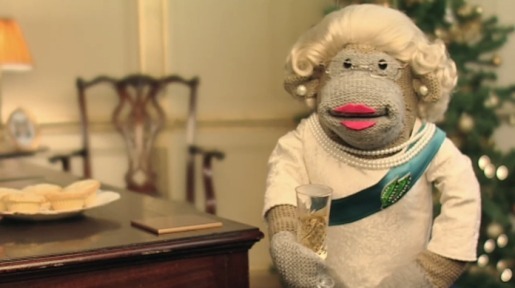 See the aforementioned sketch online at www.pgtips.co.uk. It’s Al (Johnny Vegas) and Monkey’s 90 second remake of the Morecambe and Wise breakfast sketch, using the same music (The Stripper) and some of the same moves, ending of course with a great cup of tea. The Queen’s Speech was developed at AKQA by executive creative director James Hilton, creative directors/copywriters Colin Byrne and James Capp, copywriters Ben Oliver and Leo Thom, agency producer Lindsey Moyes, account director Rowena Minhas, account manager Jon Freshwater. Filming was shot by director Chris Balmond via Red Bee and AKQA.Film. Post production was done at Framestore, produced by Laura Gould. Sound was designed at Factory Studios.